I'm usually drawn to more earthy types of weddings, but every once in awhile I love thinking about an incredibly sleek modern affair. 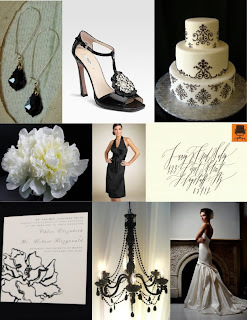 Inspired by an all white peony bouquet, this board shows a wedding created entirely around a black and white palette. A lot of people have a hard time incorporating black into a wedding because they feel it is too "funeral-esque", but I think b&w weddings are absolutely beautiful when done correctly. The key is only add touches of black- in your jewelry, by using a checkerboard dance floor, the tuxes, etc, and to leave everything else white or a metallic (such as candlesticks in mercury glass or silver). And remember- if you're trying to keep your wedding from being associated with death and or halloween, steer clear of black roses (or any other flower for that matter) and black candlesticks! Think 007 and beautiful b&w photos- not the Addams family.